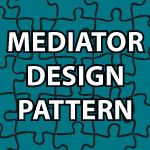 Welcome to my Mediator Design Pattern Tutorial! The Mediator design pattern is used to handle communication between related objects (Colleagues). All communication is handled by a Mediator Object and the Colleagues don’t need to know anything about each other to work together. The Gang of Four description: Allows loose coupling by encapsulating the way disparate sets of objects interact and communicate with each other. Allows for the actions of each object set to vary independently of one another. small correction in buyOffer() function. Yes Atul u r right .. because a buyer cannot buy the shares he is selling .. buy share offer operation is intiated by Colleage 2 i.e. JP Morgan!! @Derek – Good practiccal example great tutorial!! I want to thank you very much for the effort you make preparing these tutorials. There are very few people on the web that are both willing to teach and along with that know what they’re doing. These videos are great supplement to the GOF’s book. BTW, this is the first video that was really hard to grasp. The reason was the financial theme you’ve chosen to deal with. It took me 5 minutes to understand the pattern, but 20 minutes to get into broker-shares-sale-buy relationship 😀 I’m definitely dumb in finance..